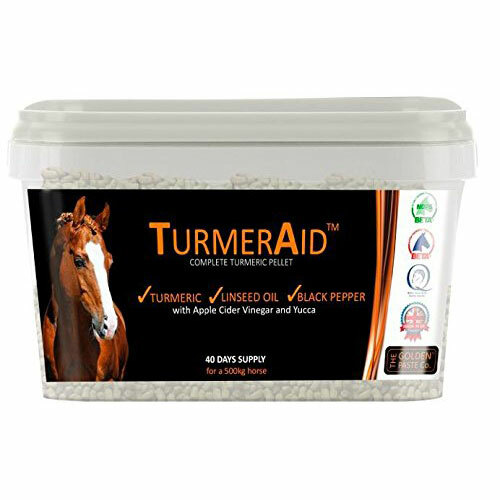 We are delighted to offer TURMERAID™ Turmeric Pellets for horses and ponies. Made with Turmeric certified with 5.1% Curcumin, they include Linseed Oil which helps to maintain a healthy and shiny coat and freshly cracked black pepper to aid bioavailability. We have included Yucca (Micro-Aid ®) to aid digestion. Yucca also has positive effects on the Micro Flora that occur naturally in the horse’s stomach and also included Apple Cider Vinegar to increase palatability. For a 500kg horse/pony – 25g, twice a day. For smaller ponies (under 300kg) feed 12.5g twice a day. For larger horses (over 700kg) feed 50g-75g twice a day.